Charles Le Brun was born in Paris in 1619. He was a French painter and art theorist, one of the dominant artists in 17th century France. At the age of eleven, he was placed in the studio of Simon Vouet. He was also a pupil of François Perrier. Le Brun and Colbert founded the Academy of Painting and Sculpture, and the Academy of France at Rome, and gave a new development to the industrial arts. Le Brun primarily worked for King Louis XIV, for whom he executed large altarpieces and battle pieces. He died in February 1690 from an illness. Phys·i·og·no·my [fiz-ee-og-nuh-mee, -on-uh-mee] : the art of determining character or personal characteristics from the form or features of the body, esp. of the face. 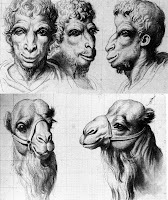 Le Brun did multiple lectures on the topic of Physiognomy. According to him, physiognomy is judging characters according to the features of the face. 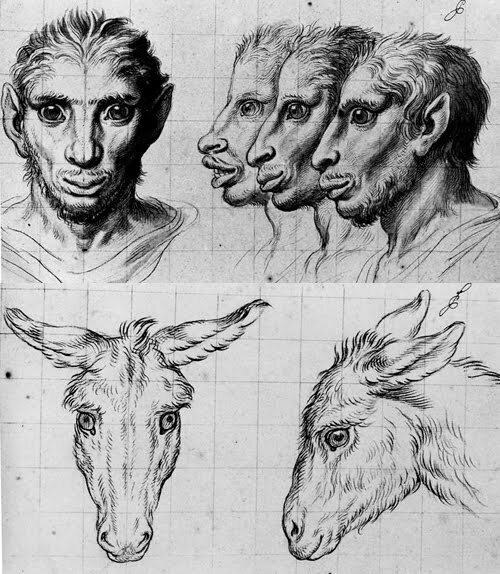 Le Brun created a series of drawing bases on the ideas of physiognomy and directed it toward the comparison and combination of animal and human faces. 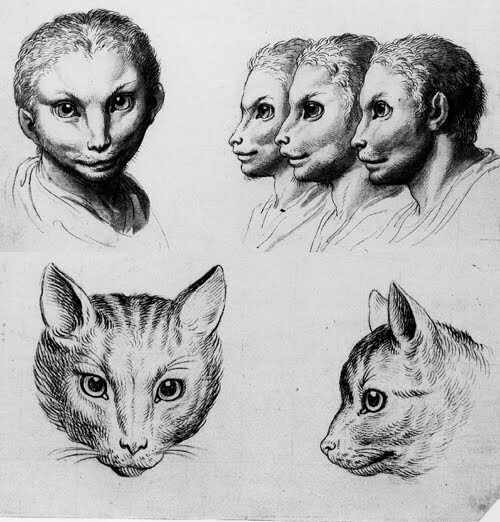 His drawing trended to humanize animals and dehumanize humans. 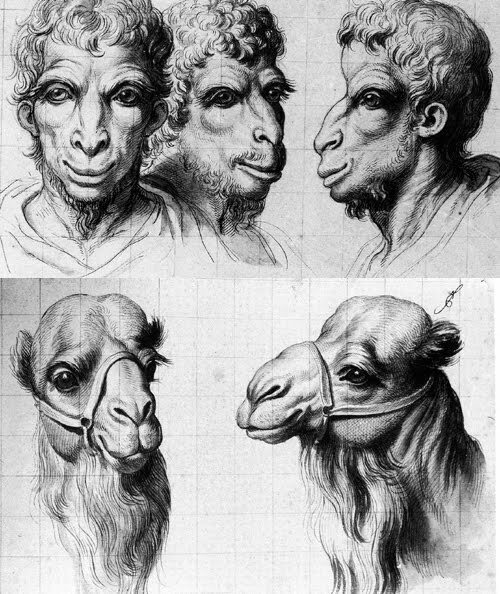 He used geometric measurement to align the faces of the animals and humans to find the similarities between the two and utilize them in the drawings. 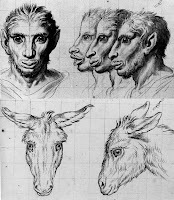 Le Brun states " all of the various manifestations that he had drawn, both animal and human heads, pointing out the features marking their natural inclination." Gareau, Michel, Brun Charles Le, and Lydia Beauvais. Charles Le Brun: First Painter to King Louis XIV. New York: H.N. Abrams, 1992. Print. 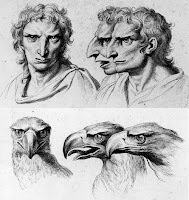 "Le Brun attached great importance to the line of the eyes and eyebrows, and drew different conclusions depending on whether it was directed upward toward the soul, or downward toward the nose and mouth, considered to represent the more animal aspects of human nature. 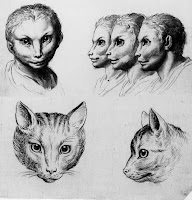 Le Brun inferred human personality and faculties and animal character from a geometric analysis of the structure of the head." J. Baltrušaitis, Aberrations. Essai sur la légende des formes, Paris, 1983, p. 26. I chose this artist because I am still intrigued with the idea of combining characteristics and personalities of animals and humans. The relationship between the two is really interesting to me. I enjoy seeing pets and their owners who share similar appearance and/or personality. I am just not sure how to portray something like that in a photography. Thanks Mark! I've seen the series of crying children before but not animals, so I will definitely check it out.